WITH the UAE all set to introduce a label to certify halal products, the halal industry is eagerly awaiting the first major gathering of scholars, government bodies and industry experts since the move was announced. The 3rd OIC Halal Middle East Exhibition & Congress, which will be held at Expo Centre Sharjah this month from December 8 to 10, will be an invaluable platform for manufacturers, dealers, retailers and industry professionals to gain insights into the implementation of the move. It is also significant since different countries that produce and supply halal products follow different standards for qualifying a product, thus making it difficult for consumers to identify a product – whether food or a banking scheme or even cosmetics – as truly halal. “However, with the UAE deciding to launch the national mark as part of the UAE Scheme for Halal Products, that obstacle will soon be a thing of the past. The unified halal standards will also act as a catalyst to accelerate the growth of the halal industry,” said Saif Mohammed Al Midfa, CEO, Expo Centre Sharjah. Held under the patronage of HH Dr Sheikh Sultan Bin Mohammed Al Qassimi, Supreme Council Member and Ruler of Sharjah, the 3rd OIC Halal Middle East Exhibition & Congress will consist of a trade fair and a congress, a series of specialised workshops and a complementary show, the 2nd Kitchen Equipment & Technology Exhibition Middle East. 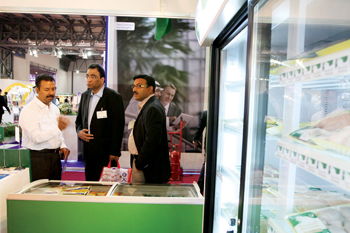 This year, the show is hosting more than 125 exhibitors from Algeria, Austria, Egypt, Germany, India, Iran, Italy, Kyrgyzstan, Lebanon, Malaysia, the Netherlands, Pakistan, Spain, Thailand, Turkey, the UAE and the US. Held under the theme ‘Opening doors to the trillion-dollar market’, the event will be the meeting place for major halal producers and buyers, scholars, ministers, senior officials of halal bodies, and several associations and certification entities. In eight sessions, the congress will discuss topics such as transforming halal logos into real brands; industry issues, concerns and their solutions; the growth and future development of halal food in non-OIC countries; the role of research scientific institutions in halal product analysis; the global halal industry trend, and misconceptions about halal. “Delegates can expect to hear from senior officials of the Islamic Centre for Development of Trade, Federation of GCC Chambers, International Islamic Halal Authority, United World Halal Development-Singapore, IFANCA, ESMA, Nippon Asia Halal Association and South Africa National Halal Authority, among others,” added Al Midfa. The Chefs Tech Arena, which will be held in association with the International Centre for Culinary Arts as part of the 2nd Kitchen Equipment & Technology Exhibition Middle East, will feature a “Basics of meat preparation workshop”. To be held on December 9 from 2 pm to 4 pm, it will host Chef Tariq and provide insights into preparing cuts and different fabrication methods of the carcass. The Halal Middle East exhibition will also host special pavilions from countries such as Malaysia, Indonesia, Korea, Japan, Libya and Iran. It will be open from 10 am to 6 pm daily. Admission is free for all trade and professional visitors only.